Check out Instagram’s latest feature: Checkout for Instagram. With Checkout there is the possibility to buy products directly from the app. Instagram has more than a billion users, so Checkout will have a huge impact on e-commerce. Instagram is no longer just a photo app anymore, it will also become a shopping platform. What is Checkout for Instagram? Do you see a nice t-shirt or the newest Nike shoes on Instagram, but you don’t want to leave Instagram to buy it? With Instagram Checkout you can just buy the product through the app itself. A “checkout” button is shown, which takes you to a page where you can choose the right size and your favorite color. As icing on the cake, you can pay right away without leaving Instagram. When making your first purchase, you must provide your name, email, payment method and shipping details. With your next order you don’t have to do this anymore, because your information is already stored. Another advantage is that you get status updates of your package. From the app you can easily know whether your package has already been sent or not. This newest feature is definitely an advantage in the world of influencer marketing. Influencers recommend your products to their followers. Checkout for Instagram ensures that followers can now immediately buy the product through the app. Collaborating with influencers already provides extra reach, but with this new feature it will also result in a much higher conversion rate, as followers of influencers they are more willing to buy something that an influencer proposes. 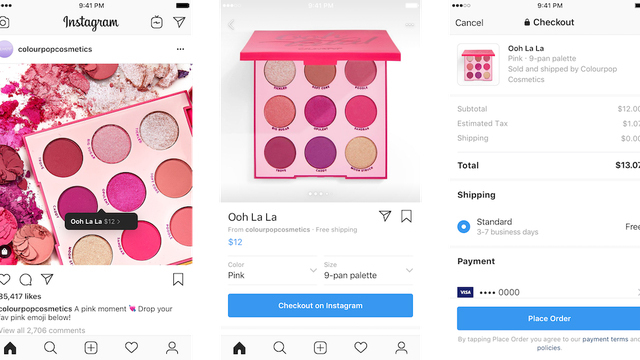 Before Checkout for Instagram was there, you might have seen the shoppable posts, but then when customers wanted to buy the product, they had to go to the website. Every extra click a consumer has to make creates an obstacle when it comes to conversion. Checkout for Instagram reduces the path to buying a product. In this way, followers are more likely to buy a product. In addition, the Return On Investment will be much higher. You invest in an influencer, but you get a lot in return, because the conversion is a lot higher. As mentioned before, followers of influencers are more willing to purchase a product, because the purchase process takes less time, but also because they trust the influencer and follow his or her advice. At this moment, Checkout for Instagram is being tested in the United States with products of Adidas, H&M, Nike, MAC Cosmetics… For this moment, it’s only a matter of time until this feature will be available in the Netherlands.